The last piece of Arduino Starter Kit, which still remains undescribed is small, but powerful integrated circuit – shift register. 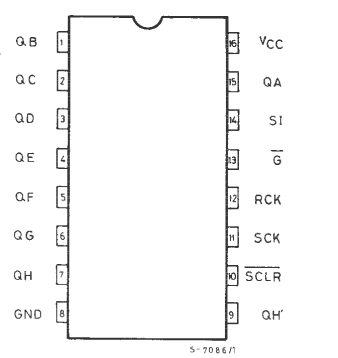 It is 74HC595, SIPO type (Serial-In, Parallel-Out) shift register with 8 parallel outputs. Shift register has serial input and some (usually 8) parallel outputs. What it means? With every clock impulse the output states are shifted by one position. So, logic level of the 1st output appears on the 2nd one. Content of the 1st output is changed depending on serial input content. We should consider using shift register in every place which needs many logic outputs. You can say that three pins can control many more outputs. Let’s see it on the simplest example – LED diodes. This article is based on tutorial published on Arduino.cc, which is source of illustrations. These are depicting more than one breadboard, but I decided to use them to speed up writing this article – making a clear illustration in Fritzing is rather impossible. Power is spreaded by rails on the breadboard. On the left board the LEDs are connected with resistors. On the right one is connected the 74HC595 itself. 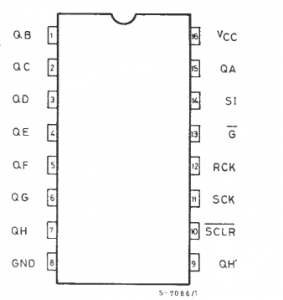 On the preceding diagram is shoved the pinout according to datasheet from manufacturer (ST Microelectronics), whose chips are in offer of Nettigo and are part of Starter Kit. On the Arduino site there is description suitable to ICs marked according to Philips nomenclature. What it means? Fortunately the only difference is signals naming (for example, outputs – in STM: QA to QH, in Philips version: Q0 to Q7), placing and functions of pins is the same. In this tutorial I will be using naming compliant with STM. //as multiplying the decimal number by two. //function pin 0 will light. //blink "n" and the pause between them "d"
//has its full visual effect. This will light all the diodes, then light every diode one by one, flash all the LEDs twice and light again using another method.